As an internet user, you may not only browse internet only for entertainment, watching videos, channels, or connecting with your friends through social media networks etc. but also while browsing internet, you may look to get some information or solution for your problem on the internet. After searching a solution for a problem, you get the solution on a web page and it is solved your problem. But sometimes you may need it in later time. Let suppose you want to share it with your other friend or want to read it later so in that cases you need to save this webpage so you will be able to do so. If a person asks that why I need to save a webpage as a pdf? Well it is not must need to save a webpage as a pdf file. You can also just copy the text and paste it to a text editor so you will have access to these in later time. But I will prefer to save it as a pdf file because images/screenshots will also be there so it will be easy for the others to understand it easily in case if you want to give it to your friend. Well, here what if you have a google chrome web browser as a default browser and you want to save a webpage as a pdf file? Don’t worry; google chrome has enabled this feature for you. Yes unlike the other browser, if you’re using google chrome, you can save a webpage as a pdf file. If you don’t know how? And want to learn then it is very easy and straight forward, the procedure is given in below steps. 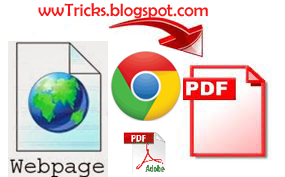 Step-1: First of all you have to open a web page which you want to save as a pdf in google chrome browser. After it loaded, now press Ctrl +P buttons from your keyboard. Step-2: After you pressed these buttons, a new window Pop-ups where at the right side, you can see the preview of the pdf file. i.e how it will look like. You can zoom in or out this from the options given at the right bottom of that window. 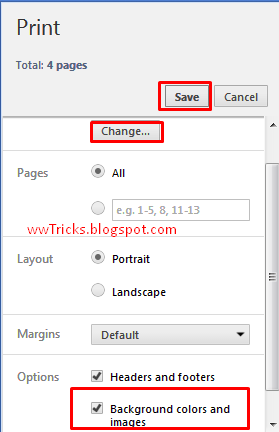 Step-3: Also make sure that you have selected “Save As PDF” which can be done by clicking on change from the left side of that window. So change from the” Microsoft xps document writer” to save as pdf. You can also make the layout to landscape mode but the portrait is good. Keep margin as default or you can also choose custom or minimum. Also make sure to select “Background colors and images” for better look of the file. Step-4: Now you can save this page as a pdf file. And it is worth click on “Save” button at the left top of that window. So save it and check how it is saved! So friends, in today’s post we discussed a useful feature that is available only in google chrome this time. You can also save a webpage as a pdf file in other browsers but it needs either to install an add-on for it or use an online tool. We will try to check these and share with you in later posts. Also do share this post with your friends.